This sweet and tasty looking bookmark is definitely an ideal bookmark to use during the festive period. It makes a lovely little gift, great as a stocking filler, for anyone who loves to read a good book at Christmas. The bookmark is double sided so is very thick and robust. On one side the design features two gingerbread men with the text ‘Reading is Sweet’. The other side features the two gingerbread men placed against a red heart patterned background. 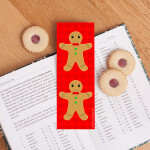 Be the first to review “Gingerbread Man Double Sided Bookmark” Click here to cancel reply.